The previous manager in Colorado was Walt Weiss, a popular former Rockies player. Weiss had been the Rockies scrappy shortstop from 1994-97 during the time of the ‘Blake Street Bombers’ of Larry Walker, Andres Galarraga, Vinny Castilla, and Dante Bichette. But popularity and nostalgia weren’t enough for Weiss to keep his job at the team’s helm after he fashioned just a 283-365 mark. None of his Rockies teams finished higher than third place. Enter Black, a15-year veteran pitcher in Major League Baseball who won 87 games while pitching with five different organizations. The righty won a World Series as a member of the 1985 Kansas City Royals starting rotation. Black had also been a bit player in some MLB historical moments during his playing time. He was the starting pitcher for the Royals at Yankee Stadium in June of 1983 for what would become known as the George Brett ‘Pine Tar Incident’ game. He also surrendered both Reggie Jackson‘s 500th and Mike Piazza‘s first career home runs. In the first half of the last decade, Black served as the pitching coach with Mike Scioscia‘s early Angels teams. He was in charge of the Halos arms as the team captured the 2002 World Series championship. 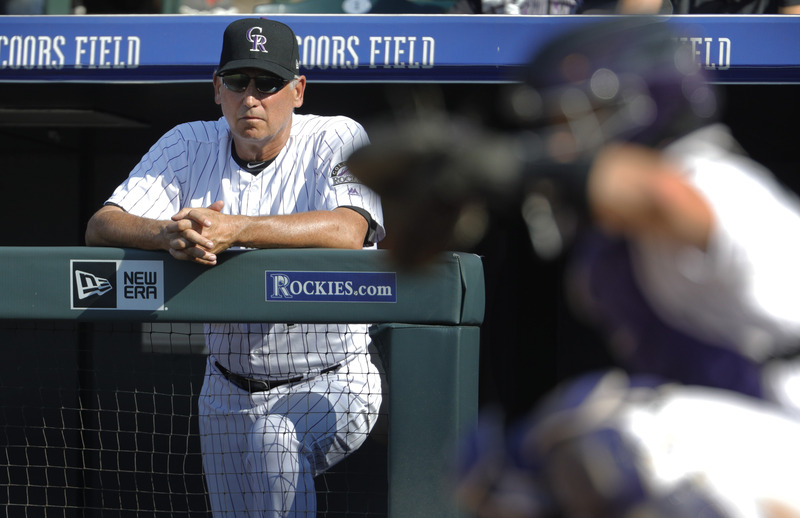 Black was brought in by young Rockies GM Jeff Bridich in hopes that his decades of experience as a player, coach and manager would help the team overcome a history of futility. This is the 25th year of Colorado Rockies baseball, but just three times has the organization reached the postseason. There has been no playoff baseball in Denver since October of 2009. It has been a largely successful first season for Black as the Rockies skipper. After 140 games, the club controls the second National League Wildcard wildcarplayoff berth. However, with just over three weeks to go, their lead is just three games over both the Milwaukee Brewers and Saint Louis Cardinals. The Rockies have been staggering along for just over a month now. Since August 5, Colorado has fashioned just an 11-18 mark. That’s a month of mostly bad baseball. However, with September and the stretch run of the season now underway, the team may be regaining some equilibrium. On Thursday night, the Rockies blitzed Clayton Kershaw and the division-leading Los Angeles Dodgers by a 9-1 score. It was Colorado’s third win in their last four games. Black is hoping that his lineup, which has produced nine runs twice now in three games, is beginning to feed off one another once again. When they’re healthy and feeding off one another, the Colorado lineup can be downright frightening for any pitcher to face. Nolan Arenado, DJ LeMahieu, Charlie Blackmon, Mark Reynolds, Carlos Gonzalez, Gerardo Parra, Trevor Story, Jonathan Lucroy, and Ian Desmond make for as daunting a lineup as there is in the game. Three more weeks. They need to continue feeling that momentum from one another, feeding off it, spreading it around to one another like the contagion described by Black. If they do, the Colorado Rockies will once again get to enjoy the thrill of October baseball.